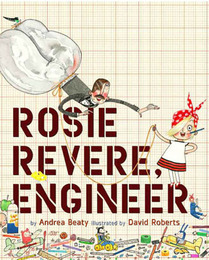 Rosie Revere Engineer is the story of a young girl who is afraid of failure but is eventually encouraged to share her inventions by her great-great aunt Rose. This book teaches us about collaboration, failure, and persistence (grit). I can imagine this book being a cornerstone of a lesson on establishing norms for engineering tasks. I will be putting together some lesson plan ideas for this picture book (and others) over the summer …so stay tuned. HERE are some lesson ideas provided by the author. Below is a video of a Rosie related project sponsored by STEM Outreach NIU… unfortunately, this video does not use the Engineering Design process from NGSS. This entry was posted in design/engineering, NGSS, Science teacher Professional Development, STEM. Bookmark the permalink.